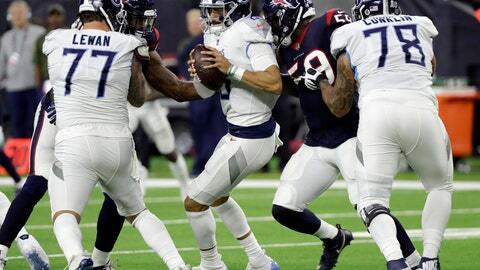 NASHVILLE, Tenn. (AP) — The Tennessee Titans have an issue protecting their quarterback right now with Marcus Mariota taking hits from defenses he hasn’t experienced since his rookie season. Now the Titans are on their second different coach since Mariota’s first year in the league, and Tennessee has allowed an NFL-worst 39 sacks with 17 in the four games since the team’s bye. Mariota has been sacked 35 times this season, missing only one of the sacks over the past month after a stinger knocked him out of a 38-10 loss at Indianapolis on Nov. 18. That was a big issue Oct. 14 when Baltimore sacked Mariota a franchise-record 11 times and providing a reminder that throwing the ball away can be a quarterback’s best play at times. Mariota says it’s a happy medium knowing when to try to keep a play alive. “It’s being able to make plays, but at the same time, knowing when the journey is over to avoid getting hit and finding ways to live for another down,” Mariota said. The Titans kept their offensive line together after allowing 35 sacks all last season, up only slightly from 28 in 2016. They made two-time Pro Bowl left tackle Taylor Lewan the NFL’s highest-paid offensive lineman during training camp with a five-year, $80 million contract, and right guard Josh Kline signed a four-year extension during the offseason.